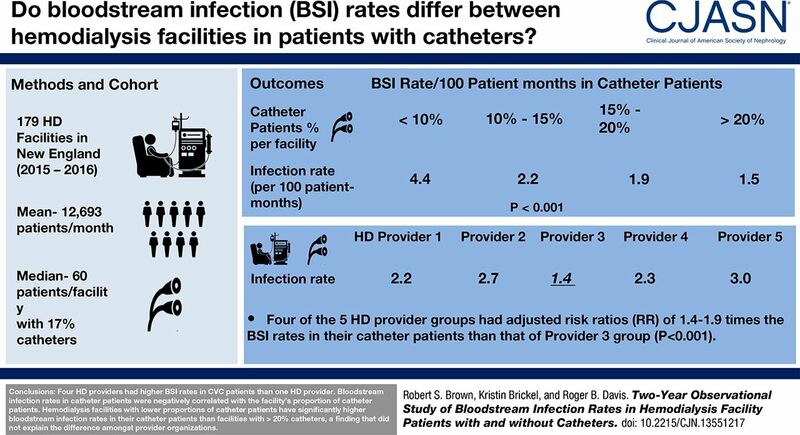 Adjusted risk ratios and 95% CIs of bloodstream infection (BSI) rates in 2015-2016 showing increased BSI risk in four of five batch submitting hemodialysis provider organizations for patients with catheters but not for patients without catheters. (A) patients with catheters and (B) patients without catheters. Results are on the basis of multivariable regression models (Table 2 footnote a) with Provider 3 group as referent. 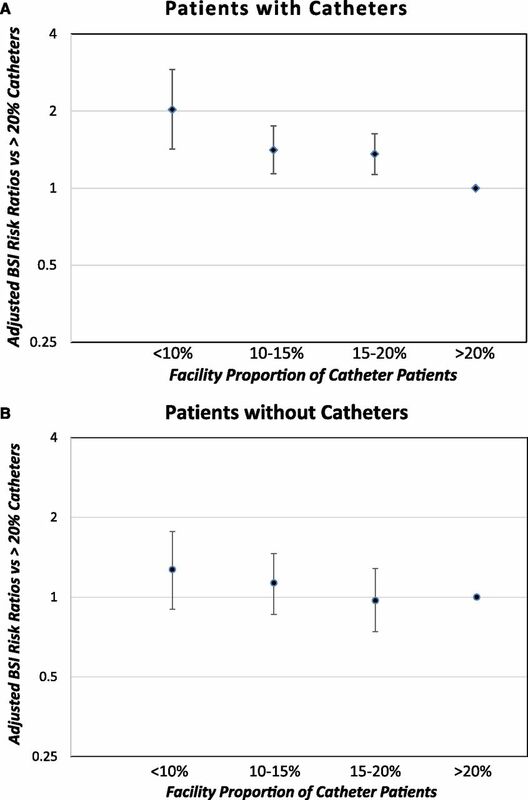 Adjusted risk ratios and 95% CIs of bloodstream infection (BSI) rates on the basis of facility proportions of catheters in 2015-2016 showing increasing BSI risk with lower proportions of catheters in the patients with catheters but not the patients without catheters. (A) patients with catheters and (B) patients without catheters. Results are on the basis of multivariable regression models (Table 2 footnote a) with >20% catheter patient population as referent. ↵a The five batch-submitting organizations remain in the same randomized order as Tables 1 and 2. The 11 hospital-based outpatient facilities are listed separately from the other provider groups, which show only the percentage of patients with catheters in their nonhospital-based facilities. 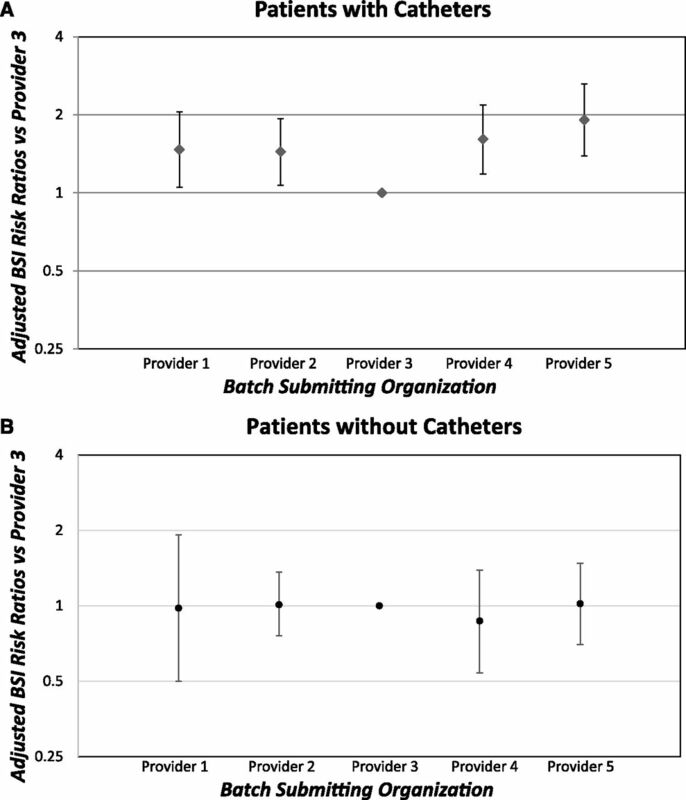 Despite the significant differences between provider organizations, the percentages of patients with catheters did not account for the differences in bloodstream infection rates in this patient group between the provider groups.